We’ve been busy working to raise awareness back in our home state of Washington. During these past months we’ve recieved quite a few inquiries about what people can do to help with the Oak Flat cause, so we’ve put together a list of ten ways you can help save Oak Flat. Thanks for your continued support, and keep up the good fight. The first step to effective advocacy is to understand the issue. Visit www.walktosaveoakflat.com and www.apache-stronghold.com to learn the history and current events of Oak Flat. You don’t have to memorize all of the ins-and-outs, but know the basics of the story so you can speak about the issues and answer peoples’ questions accurately. Sometimes it feels like calling or emailing your representative doesn’t do much, but legislative insiders say it really does make a difference. You can look up the contact information for your representative at www.congressmerge.com/onlinedb/index.htm or schedule an appointment with a staffer at www.house.gov/representatives/. Feel free to use our sample letter available at walktosaveoakflat.com/donate-to-the-walk/. Whether you contact your representative by phone, email, or in person, your focus should be on HR 2811, the Save Oak Flat Act. The Act was introduced in the House of Representative over the summer of 2015, and is in the early stage of the lawmaking process. Ask your representative to be a co-sponsor and support the bill. The Save Oak Flat Act is currently sitting in the House Committee on Natural Resources. To move forward, the bill must have a hearing. You can view a list of committee members here: naturalresources.house.gov/about/members.htm. Contact the Chairman Rob Bishop asking for a hearing on HR 2811, and get in touch with other committee members as well if they are from your state. If you’re on Facebook, “Like” Apache Stronghold and Saving Oak Flat Campground Facebook pages, and visit them often to keep up with news, new petitions, and events that need your support. A lot of people across the U.S. still don’t know about the Oak Flat giveaway, so spreading the word via social media to an ever-broadening circle is essential. Write a story for your local newspaper or send a letter to the editor. We can share photos to help you give a good pitch. If you want to try your hand at writing a magazine article, think about writing with a point of view that’s relevant to you. For example, are you a student? If so, you can write an article about why you want Oak Flat to be preserved so that you’ll get to take your own kids there someday. Write from a parent’s or grandparent’s point of view. Write as a hiker, climber, or camper. Something has drawn you to want to help- what is it? Write about that. There are so many print and online magazines, the possibilities are endless. You can find submission guidelines online. There have been a number of petitions that have circulated for Oak Flat, so if you see a note for a petition take a moment to read it and sign if you haven’t already. It may not seem like it has an effect but it’s important to help each person circulating a petition to build a strong case. Apache Stronghold, The Sierra Club, AVAAZ, Rep. Grijalva, and the Arizona Mining Reform Coalition have all circulated petitions, and you can sign each one. Can you set up a table and share the story at an event, school, church, Rotary, or other meeting? We can help you with a Power Point presentation to show on your laptop and flyers to hand out. Plan in advance and let us know if you need materials. Always be sure to ask permission before you set up and follow the rules an organization sets out for its participants. This is a peaceful protest and will be won with dignity and respect, so please reflect that in your presentation. If you have a large audience and would like to see if someone from Apache Stronghold can come to your event, ask and we’ll see if it’s possible to send a spokesperson to your area. Buy and wear a Protect Sacred Oak Flat T-shirt at Facebook/protectsacredoakflat.com. Your purchase supports the cause and you help spread the word when you wear your shirt – plus you look totally cool! Resolution Copper has lots of money to put toward media campaigns, buying ads on Google, supporting Congressional candidates who walk their talk. Your donation to Apache Stronghold helps fund print materials, speaking engagements, media campaigns, and the Oak Flat occupation. If you have the resources available to do so, come see Oak Flat in person. You’ll understand the cause better than anything you can read if you spend some time on site. Get to know those who’ve been occupying for the long haul, share meals, and swap stories. 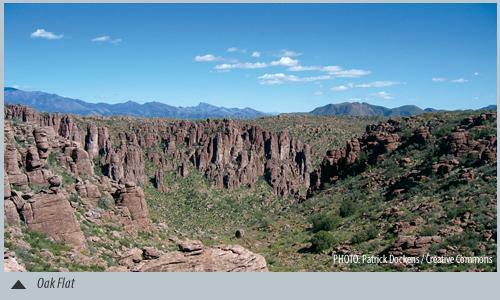 The campsite is part of the Tonto National Forest, and as such, is yours to visit. See Apache Leap, hike the trails, sleep in the desert under a blanket of stars. It will definitely be an unforgettable experience.